The content of this article provides interesting history, facts and information about the Emperor Marcus Aurelius and the all-powerful Caesars who ruled the empire of Ancient Rome. 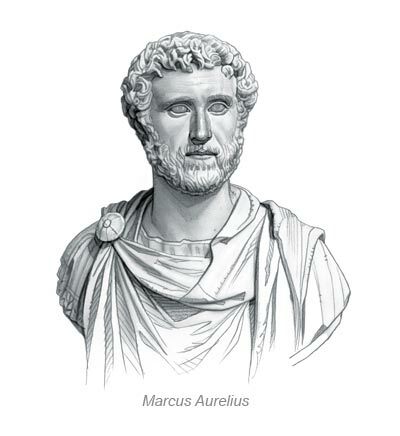 "The Philosopher, last of the Five Good Emperors"
Short Biography profile and facts about one of the most famous Romans of all, in the life of Marcus Aurelius, Emperor of Rome and provinces of the Roman Empire. Early in the previous reign Antoninus Pius had made Marcus Aurelius his associate in the government of the Roman Empire. His health had suffered and Marcus Aurelius needed to share the government of the empire with his adopted brother, Lucius Verus, who was strong and healthy but was, however, addicted to licentious pleasures. Obtain a fast overview of the times of the Roman Emperor Marcus Aurelius from the following facts and information about his life. Why was Marcus Aurelius famous? Accomplishments, achievements and important events. Marcus Aurelius was known as the Philosopher, his morals and his intellect were trained by the purest and wisest men of his age. Early in the previous reign Antoninus Pius had made Marcus Aurelius his associate in the government of the Roman Empire. His health had suffered and Marcus Aurelius needed to share the government of the empire with his adopted brother, Lucius Verus, who was strong and healthy but was, however, addicted to all forms of licentious pleasures. The Parthian king, Vologeses III, invaded the eastern provinces. Lucius Verus was sent to quell the Parthians but left the fighting to his generals who succeeded in the task. The Parthians were based in Armenia, Mesopotamia, Iran, and Afghanistan providing access to the Silk Road, the trade route between the Mediterranean Sea and China. In A.D. 166 Verus returned to Rome claiming triumph. His army brought the plague with it from the East which desolated Italy and Rome. In A.D. 168 the twin emperors escaped the plagued city of Rome to go North to the Danubian provinces, where they mounted a military offensive against the threatening Germanic tribes. Verus died in A.D. 171 riddled with disease from his dissolute lifestyle. The war with the Parthians ended the peace at first experienced in the reign of Marcus Aurelius. Barbarians called the Marcomanni, a Germanic tribe, then rebelled. They were eventually quelled by Marcus Aurelius but at great cost to the Empire and Marcus Aurelius was forced to sell the imperial plate and jewels in order to provide a new army. An insurrection shortly followed in Syria, forcing Marcus Aurelius to defend this eastern part of the empire. In A.D. 176 Marcus Aurelius triumphed at Rome for his various successes. He gave a donation of eight pieces of gold to every Roman citizen, and made his son Commodus his colleague. In A.D. 177 Marcus Aurelius was again forced to march against the Barbarians. He contracted a fever at Vindobona (Vienna) in A.D. 180, and died after a few days' illness. Marcus Aurelius was the last of the Five Good Roman emperors who labored for the welfare of his people. Despite his reputation as a benevolent Emperor Marcus Aurelius allowed a cruel persecution of the Christians in A.D. 177. Among the victims of this persecution was the Christian writer and philosopher called Justin who was the author of the Apologies for Christianity which he had presented to the previous emperor Antoninus Pius and Marcus Aurelius. Justin suffered martyrdom and was later made a saint and called Justin Martyr. A couple of years later toward the close of his reign Marcus Aurelius become convinced of the falseness of the charges made against the Christians and became once more tolerant and philosophic. The Five Good Emperors and the Nervan / Antonine Dynasty (96–192). The Five Good Emperors were Nerva, Trajan, Hadrian, Antoninus Pius and Marcus Aurelius. The Five Good Emperors were so named by the political philosopher, Niccolo Machiavelli who gave them this name in 1503 due to their good government and the respect given to them by the people of Rome. The Nervan and Antonine dynasty consisted of the "Five Good Emperors" (Nerva, Trajan, Hadrian, Antoninus Pius, and Marcus Aurelius) together with Lucius Verus, who ruled jointly with Marcus Aurelius, and Commodus the son of Marcus Aurelius. The content of this Marcus Aurelius category in the Emperors of Ancient Rome provides free educational details, facts and information for reference and research for schools, colleges and homework. Refer to the Colosseum Sitemap for a comprehensive search on interesting different categories containing the history, facts and information about the lives and people of Ancient Rome.